Rupert Wyatt's remake of the 1974 film of the same title features an extended scene where the film's gambling-riddled professor of literature James Bennett (played by Mark Wahlberg) expounds on the philosophy buried within Albert Camus' "The Stranger" to his class. The reason the shooter in the book only fired five shots was to save one bullet for himself. In essence, that sums up Bennett as well, continually pressing his luck with the underworld heads of illegal gambling and refusing to cower or make explanations when he cannot pay. It's an interesting theme which the film tries to 'literalize', but comes up woefully short. Part of the problem is Wahlberg himself. "The Gambler", written by the loquacious William Monahan ("The Departed", "Kingdom of Heaven") sounds alot smarter than Wahlberg is able to project, especially during his long winded classroom lectures where he manages to insult his students and then flirt with another (Brie Larson) all in the same breath. Jessica Lange, as his addled mother, fares much worse in her few opening scenes, playing her role just short of something camp. In fact, the only character in the entire film able to carry the script's pow-pow, hard edged rhythm is John Goodman as a high financier of money. Despite all that, "The Gambler" looks incredible, especially in its nocturnal crawl through the cavernous gambling dens of Los Angeles. All the ingredients are there for something special, but "The Gambler" just tries too hard. Not that there's anything inherently wrong with "The Imitation Game", its just an incredibly safe and anesthetized version of Alan Turing's top secret mission in breaking Nazi Germany's enigma codes during World War 2. Full of easily digestable storylines which shuffle back and forth (courtesy of even intertitles just in case one can't keep up!) between his awkward duckling youth, the enigma code-breaking tensions of the war and his fall in 1951 via a nosy cop, "The Imitation Game" wears its prestige on its sleeve. Completing my retrospective of Alexei German films, "Hard To Be A God" is quite the career-capper. A project he'd wanted to make for over 30 years and dying before the fully realized project saw the shimmering lights of the big screen, it's an audacious, confounding experiment that I admire more than like. Clocking in at 3 hours and featuring an endless procession of first person handheld cinemetography, the film is ostensibly about the inability of knowledge to impact the present, or more specifically, the past. The idea in the film is that two scientists from the future travel back to Earth during the Middle Ages. The footage we see, recorded from small cameras on their foreheads, reveals a pulsating mass of deplorable conditions, people stacked together like sardines and floating in mud, blood, vomit and feces. German's set design is completely enveloping, and the overall tone descends into madness as the scientists simply react to the barrage of non sequiter dialogue, dense and unexplained mentions of certain people and toothless grins directly into the camera. It's probably an hour into "Hard To Be A God" when I decided to let go and allow the reigning chaos to be the guide. It's a unique experience, but one I never quite want to revisit. I seem to say this every year, but I listened to ALOT of music this year. Maybe it's the fact I finally accepted the viable and gratifying vehicle of online distribution for new music, making it easily consumable. I think this is the first year in m life when I didn't buy a single cd. YouTube, Spotify and Pandora opened up whole new worlds of music for me while my own resurgance with vinyl as a musical medium not only got me buying LP's again, but also prompted me to fill in the gaps of my already pretty large record collection with odd Van Morrison and Neil Young selections. I feel comfortable doing a music list now, sampling a wide variety of highly noted releases that have consistently cropped up on other 'best of' lists from worthy publications and online friends. My only conclusion- there's a lot of awful music out there as well that has people doing cartwheels that I just don't get. Regardless, that's what makes us unique as individuals and consumers. Vocalist Jessy Lanza is new to me. I don't usually fall for this level of pop, but the hyperdub retuning of certain songs feels like an awesome throwback to the 80's. Her song "Strange Emotion" is a show stopper and the entire album is full of unique surprises and small miracles. Another introduction this year was Northwestern area band From Indian Lakes. Gaining acclaim when singer/songwriter Joey Vannuchi utilized MySpace (remember that!) to introduce some of his songs in 2009, the band formed soon after. “Absent Sounds”, their second album, lapses a bit into pop and even old-school ‘emo’ at times, yet its commitment to strong lyrics and a full sound won me over and had me playing it continuously throughout the year. At least one soundtrack grabs hold of my senses each year, and this time it was Hans Zimmer with his "Interstellar" soundtrack. Yes, there was plenty of caterwaling about the sound mix during early scrennings of the film, but I heard none of this on any of my three trips to the theater in experiencing Nolan's masterpiece- even in IMAX. Zimmer's score is loud at times, but it never dulled the emotion of the film or its dialogue, instead creating a resonant and enveloping accentuation to the film. Honestly at this point in the game, there's probably not a Mogwai release I won't love. Their latest, "Rave Tapes" doesn't break any new ground, but it carries on their tradition of low-fil chill and full post-rock sound that's made them famous. As Strands of Oak, singer-songwriter Tim Showalter assembled a minimal supergroup, including Dinosaur Jr guitarist J Mascis, and put together this album. At its core, "Heal" is another brilliant confessional by a hugely talented songwriter (like Matthew Houck and "Phospherence" last year) that doesn't play by the rules of established 'groupdom', choosing to stitch together talented people whenever possible and almost guerilla produce their intentions. "Heal" succeeds on every account. Talk about tortured confessional. Sun Kil Moon's (real name Mark Kozelek) sixth album under that nomenclature reaches intimate heights. "Benji" blazes through a range of staggered emotions, such as when he sings about the various deaths of family members by spontaneous combustion or the way the death of his grandmother elicited laughter in him due to the pent up stress. The album is honest and painful in ways that most music simply avoids. All I can say about Beck is that between this album and 2002's "Sea Change", he's quietly become the slacker Willie Nelson. We always need slacker Willie Nelsons. A punk band that sounds like a cross between The Violent Femmes and Sonic Youth is the most apt description I can imagine for Ought. Their debut album is a packed swerve through a variety of sounds.... made all the more impressive when I read they created the album by just grooving in the studio and molding songs out of that improvisation. I look forward to whatever they create next. As a fan of the Afghan Whigs since I discovered thir landmark 1993 album "Gentleman" way back in the day, "Do the Beast" is the most happy reunion in ages. Leader/frontman Greg Dulli has always pissed around with various other groups, never straying too far from the Whigs patent sound, but "Do the Beast" is something special. There's a concept here as songs bleed into one another and lyrics repeat themselves in different songs. It also feels like an album from somewhere deep in the band, wandering around in the musical world for so long and finding their place together again. "Hospice" and "Burst Apart" hovered near the very top of my favorites in their respective years as The Antlers continually create transcendetal music. With "Familiars", they've outdone themselves, infusing each and every song with heartbreak, doubt and a strong sense of memory that feels like one can picture the people and places they sing about. When Peter Silberman says "well you're already home but you don't know where to find it. It's not a house we remember but a feeling outside it when everyone's gone and we leave the lights on anyway...." the magnitude of going home never felt so prescient. It's a towering masterpiece. First and foremost, director Mark Hartley is a fanboy of the highest order, proven by his rip-roaring ode to ozploitation in "Not Quite Hollywood". I haven't seen "Machete Maidens Unleashed", but the minute I get the urge to delve into the underbelly of the Filipino film market, I'm sure it'll be the first source I crack open. Hartley's latest film, "Electric Boogaloo", charts the rise and fall of the once powerful Cannon Film company.... the production group that spawned a plethora of high voltage, emotionally simple movies on this young boy from the age of 10 to about 15. "The Last American Virgin", "Over the Top", "Missing In Action", "Death Wish 2", "American Ninja", "Cyborg"- films my friends and I snuck into the theater to see multiple times or caressed the VHS boxes on the shelves, intently conniving ways to persuade our parents to rent them. And its that connection with our youth that "Electric Boogaloo" strongly latches onto and won't let go. "Electric Boogaloo" isn't a good documentary on the most elemental level- it never raises any questions or challenges the conventions of the genre. It could easily be something produced by Cannon itself back in the day and dumped onto the Starz channel at 4am. Yet it's an insidious love letter to a certain type of film that holds a unique place in my formative film viewing years, and sometimes we have to look beyond the formal inadequacy of something and allow our ten year old self to revel in the sheer joy of not knowing any better. Jean Marc Vallee’s film does the improbable…. it takes a well worn treatise on self exile and eventual self fulfillment and makes it feel vital and organic. A lot of this has to do with the source material by Cheryl Strayed, whose life and journey the film is based upon and performed magnificently by Reese Witherspoon. Deciding to escape her troubled life and hike 1000 miles from New Mexico to Canada, “Wild” intercuts her spontaneous and tough walk with the events that landed her in a dark place to begin with. Playing like a patchwork of flashbacks, conversations, moods, memories and sounds that ebb and flow brilliantly into a stream of conscious-like scrapbook, the film coalesces into a cathartic experience. As he proved with “Dallas Buyer’s Club”, Vallee expertly handles the material and elicits vivid portraits from even the smallest secondary roles. But even more than that, “Wild” is a moving exploration of why we sometimes need to fall off the grid and allow life to catch us somewhere below. As compared to the ladies so far this year, I have to admit its been lackluster for the guys. Still, here are five performances that caught my eye. This list excepts my favorite performance of the year (and hopeful Oscar winner) Michael Keaton in "Birdman". Bill Hader in "The Skeleton Twins"
As a suicidal homosexual going home to reunite with his sister (an equally good Kristen Wiig), Hader avoids the pratfalls of indie quirkiness and creates a full bodied, conflicted presence. We all knew Hader could make us laugh, but who knew he had this performance in him? 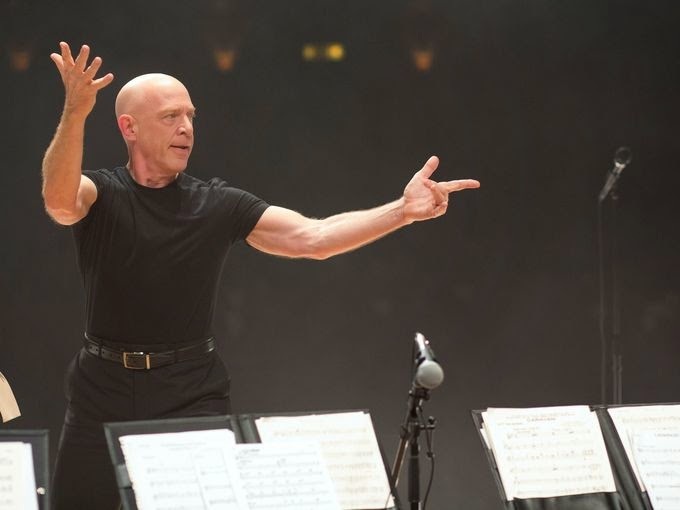 JK Simmons has long been one of my very favorite "character" actors and in "Whiplash", he finally gets the opportunity to take a bit of the center stage as a misogynistic, brutally honest and downright ferocious jazz music teacher who pushes one student a bit too far. It's a showy performance, yes, but one that Simmons inflects with every inch of his muscular arms and shaven head. 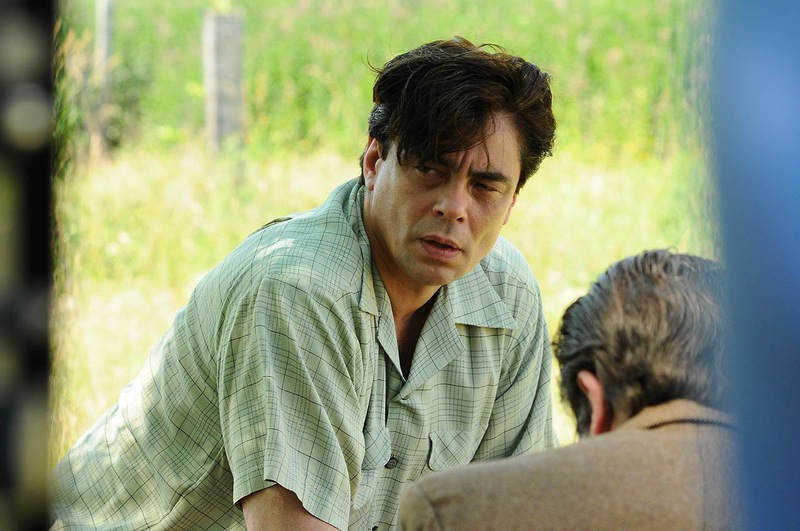 Benecio Del Toro in "Jimmy P."
It's encouraging to see Arnaud Desplechin's early year release "Jimmy P; Psychotherapy of a Plains Indian" popping up on a few best of lists. It's a wonderful little film, populated by a series of one-two discussions between Del Toro and doctor Matthieu Almaric. Del Toro gives a quiet, focused performance of a man struggling with PTSD before anyone really knew what it was, enhanced by his nondescript status as an American Indian. The final scene between Del Toro and his daughter is a knockout of internal acting and just shows how great Del Toro has been for so many years now. In a film where anyone of the three main performances could be cited as terrific, it's Ruffalo who resonated most profoundly with me. Another highly internal performance (seeing the common denominator with this list), Ruffalo acts with his eyes, body language and almost hushed sense of presence as the older brother to Channing Tatum. 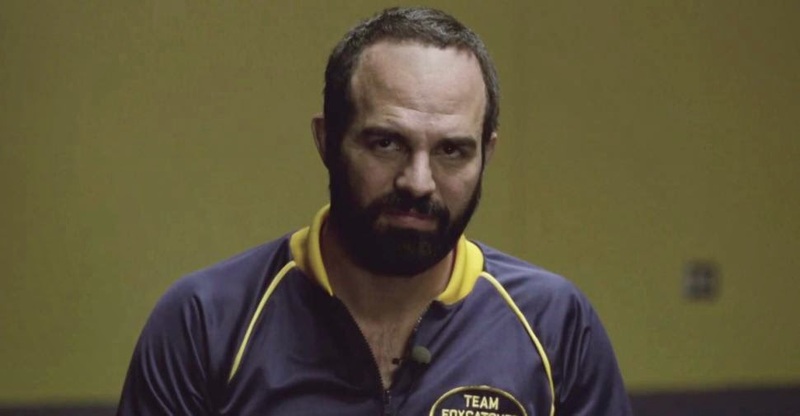 "Foxcatcher" builds to a violent finale, and its Ruffalo who made me care the most in this triangle of misplaced patriotism, jealousy and decaying sense of self importance. 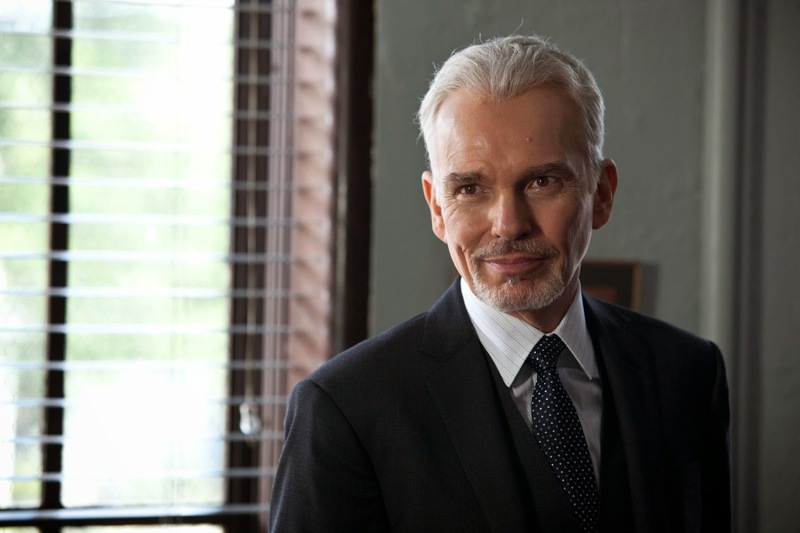 Billy Bob Thornton in "The Judge"
After "Trial On the Road" (1971) and "Twenty Days Without War" (1977), two films that dealt with the experience of war (or, more specifically the absence of it in one), filmmaker Alexei German's next project was delayed almost ten years. Filmed in 1985 but not debuted until two years later at a Moscow film festival, "My Friend Ivan Lapshin" may be his masterpiece. German's visual schematic of cluttered, claustrophobic interiors and snow-laden exteriors, both barely able to contain the perpetual movement of bodies and the thoughts that spew from them, again represents German's snapshot of a particular place and time. Set in the mid 30's just before the Stalin purge of Russian Jews and the onslaught of World War 2, "My Friend Ivan Lapshin" takes its time in eventually focusing on the titular character, choosing to embellish mood and atmosphere before real narrative sets in. 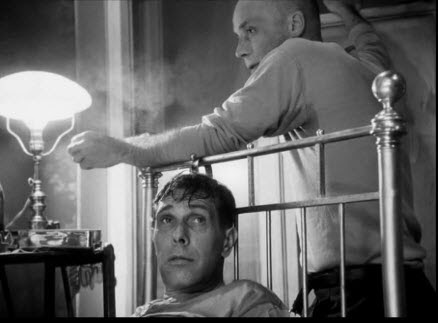 Like all of German's films, they can be hard to penetrate sometimes.... full of political allegory and off-hand lines of dialogue that explode with hidden anger or poetic jealousy. While "My Friend Ivan Lapshin" has its share of obfuscated moments, it's German's most accessible and tangible work. Playing out in a three part episode, half remembered by an off-screen voice over of a young child now grown into a man, "My Friend Ivan Lapshin" introduces us to its array of characters as a mixture of families and policemen living in a communal household. Boisterous and playful, we soon me Ivan Lapshin (Andrei Boltnev), the most respected and even tempered of the group. The middle section of the film introduces the relationships in Lapshin's life in Khanin (Andrey Mironov), a writer quietly reeling from the death of his wife and an actress named Natasha (Nina Ruslanova). Lapshin has a crush on Natasha, but is soon rebuffed by her when its discovered she's already started an affair with Khanin. One would imagine the potential for jealousy and third act retribution would kick into high gear after this revelation, but it's ignored by German and even has Lapshin and Khanin continuing their friendship into the final act where Lapshin invites Khanin with him on a manhunt for a group of wanted criminals. Its the final act, filmed in a staggering and tense-ridden long take, as the cops descend through a fog into a small village looking for the criminal that "My Friend Ivan Lapshin" coalesces into a prominent work. By this point, we care so deeply for Lapshin and the enveloping atmosphere of 1930's Russia that the spectre of "something big" lingers over the entire film. And even in that regard, German has a narrative surprise for us. Viewed within the context of his larger body of work, "My Friend Ivan Lapshin" fits neatly into his themes of nationalism and scrapbook-like remembrances from his writer father Yuri. Two small portions of the film inexplicably turn into color stock, fashioned like old polaroid photographs burned into one's memory. Also, the dichotomy of society/war/lawfulness meeting the artificiality of a staged play was a large part of "Twenty Days Without War". Both films also posit a doomed relationship between the drifter/warrior and an actress.... almost as if the two columns of life can never fully mesh. And equally doomed is everyone in the film. With the sweeping changes we know from history on the horizon, "My Friend Ivan Lapshin", like Ingmar Bergman's "The Serpent's Egg" or Haneke's "The White Ribbon", is surepptitously about the passing of a generation... an observation made innocently by the final (color) image and a voice decrying the amount of traffic and tram lines encasing the city. There are no more Ivan Lapshins left. While simmering tension and dread is there right from the beginning in Bennett Miller’s true tale “Foxcatcher”, the resounding impact from the film remains its stillness. Many scenes are shrouded in quiet, almost hushed conversations, all of which makes the emotional explosion towards the end that much more shocking. Tracking the doomed relationship between wrestling brothers Mark and Dave Schultz (Canning Tatum and Mark Ruffalol) and wealthy Olympic supporter John E. DuPont (Steve Carell), “Foxcatcher” is a dense study in repressed emotions from all sides. While Carell undergoes the most physically transformative of the roles (and he is really, really good), the best acting comes from Tatum and Ruffalo. With statures like apes and lacking the ability to fully express their sentiments outside of casual positive reinforcement or the comfort of each other’s body in practice, “Foxcatcher” soon becomes a pointed attack on the ‘haves’ versus the ‘havenots’. This widening gulf eventually swallows everyone and director Miller orchestrates the quiet apocalypse with deft precision. “Citizenfour”, directed by Laura Poitras, is a documentary of prescient timing. Not only was Poitras in the right place and time to document and record whistleblower Edward Snowden’s journey through the media minefield, but “Citizenfour” fits in snuggly with our current preoccupation of governmental distrust. I’m not saying it’s a perfect film, but I can’t imagine a more timely release for a real life paranoid expose like it. Receiving cryptic emails from Snowden almost eight months before coming out with his classified NSA documents concerning the level of privacy piracy by the government, Poitras builds her film around the hotel room conversations she and Snowden (and journalist Glenn Greenwald) recorded. These conversations- in which justification, anxiety and some doubt creep into Snowden- establish the beating pulse of the film. Less interesting are the bits of context mixed around the interviews, namely hearings on privacy invasion and talking head media conferences. Included, I’m sure, to educate the general viewer on the rampant encroachment of industry upon personal privacy like a visual Wikipedia, I felt them a bit redundant and ultimately a remedial effect for the film. Back in the director-actor seat again, Tommy Lee Jones tackles the western with “The Homesman”, a genre that yielded strong results a few years ago with his “The Three Burial Of Melquidas Estrada”. Where that film was lean, savage and complex, “The Homesman” struggles to find and maintain a tone from the very beginning. Hilary Swank stars as Marry Cuddy, a woman alone in the Nebraska territory who takes on the mission of transporting three mentally unstable women to Iowa. Drifter and general malcontent Jones comes into the picture when Swank saves him from his impending death and charges him with helping her on the journey. The imbalance between the very dark, dream-like existence of the three crazy women and Swank and Jones’ almost cartoonish relationship continually makes “The Homesman” a puzzling effort. Like a character out of a Peckinpah western, Jones embodies his George Briggs as heartless, misanthropic and a bit cowardly, yet we’re expected to see the ultimate good in him as the credits roll. Equally schizophrenic is Swank’s Marry Cuddy… fiercely independent in the way she steps up into the role of woman’s savior but secretly yearning for nothing more than the modest subjugation of marriage. Sketching characters with these broad strokes of emotional complexity is never a bad thing, but “The Homesman” lacks any real depth in its exploration, especially in a third act twist that feels forced in its corn field journey of martyrdom. David Ehrlich kicks off the end of the year extravaganza with another of his beautifully composed and symbiotic Top 25 of the year in film. I so love these things.